The forecast was for record-breaking cold weather with a dollop of snow after the forecasters said we would have an early spring in mid-Missouri, USA. Greenery was starting to pop up in my garden including one of my favorite spring flowers, the early, old-fashioned daffodils sprinkled through my one-acre hillside garden. These daffodils have been rescued from several old house sites with the owner’s permission. They are not big, or fancy, their claim to my heart is that they are the first daffodils to bloom in spring, a promise of more flowers to come. When I heard the forecast, I headed outside to see if there were any daffodils getting ready to bloom. Although they can often make it through snow, I wasn’t so sure about record cold temperatures so I picked a few already in bud form. 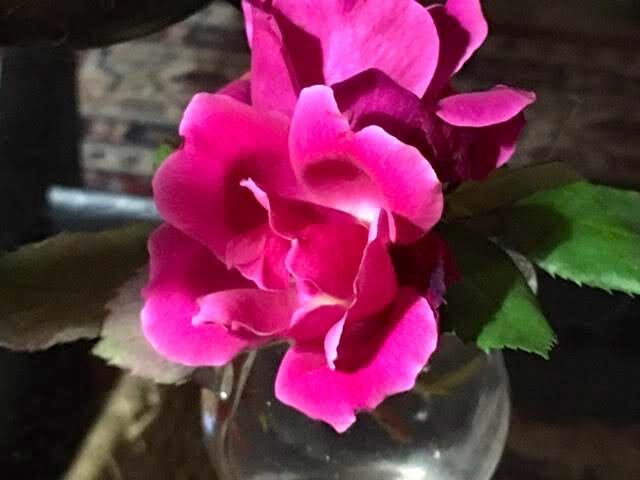 Once inside, I trimmed their stems to the same length and placed them in a 5-inch porcelain flower vase that easily fits on a tray on my den coffee table. After the first couple of days inside, the early daffodil buds started to show progress as the sweet yellow flowers made it to the blooming stage. 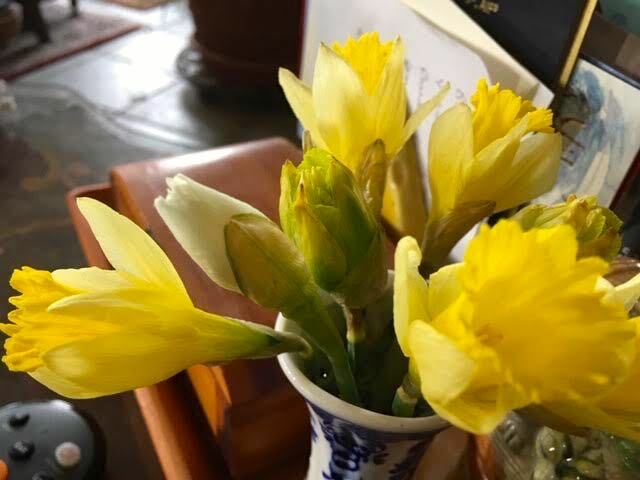 I have two kinds of very old-fashioned daffodils in the vase. One is the small, early daffodils and the second is a double daffodil no longer available on the market. The double daffodils are not as reliable as cut flowers, you can see the one on the bottom left is drying up faster than the one in the center. Although I know the double ones sometimes don’t develop as cut flowers, I included these two in case they made it. I also gave a friend a tiny bouquet of these early daffodil buds for her kitchen table. She said they are all open now and greatly cheered her up during this last winter storm. Wait, looks like I have a third kind of daffodil getting ready to bloom with the early daffodils. See the white daffodil bud? Fun to try to guess what color this will be once it blooms. Early daffodils are one of those wonderful spring blessings like in this spring blessings lap quilt throw, a sign that cold weather should be almost over and a promise of warm days in the garden ahead. Not that this makes any difference to how I decorate my ecclectic house and practical wardrobe but I do find the color of the year selections interesting. Pantone, the self-proclaimed global authority on color, has declared "Living Coral" the color of the year for 2019. "Just as coral reefs are a source of sustenance and shelter to sea life, vibrant yet mellow, Pantone 16-1546, Living Coral embraces us with warmth and nourishment to provide comfort and buoyancy in our continually shifting environment," according to Pantone’s news release. This year, with technology and social media ever encroaching on our daily lives, Pantone thought it was the appropriate time to turn to nature and its beautiful colors. Not surprisingly, colors in nature have been the choice for the past few years. If you struggle with the actual color, here is a bag that has both the pink color at the bottom and coral at the top. Now a couple of decades ago when I was re-modeling my house, I asked the designer helping me with wall colors to pick a warm, inviting, a bit of a “hug” color for my bedroom. The color she picked was terracotta, which is a lighter version of the Sherwin Williams 2019 color. Cavern Clay SW 7701A “is a nod to midcentury modern style, but with the soul of the American Southwest, which together creates a desert modern aesthetic. “This warm, earthy hue is both casual and refined. It can be the backdrop of a playful, welcoming dining room or kitchen when paired with bright tiles, warm stone and sculptural greenery. Complementary materials include leather, simple woodgrains and indigenous cacti in contemporary, sleek gardening planters. Cavern Clay is an easy way to bring the warmth of the outdoors in. Envision beaches, canyons and deserts, and sun-washed late summer afternoons—all of this embodied in one color.” It’s not a coral color but it sure is close. We have one handmade quilt that has a coral tone to it, Embroidered Sunbonnet Baskets. If you like to stay on trend with color, this is a quick surefire way to update your bedroom in style! 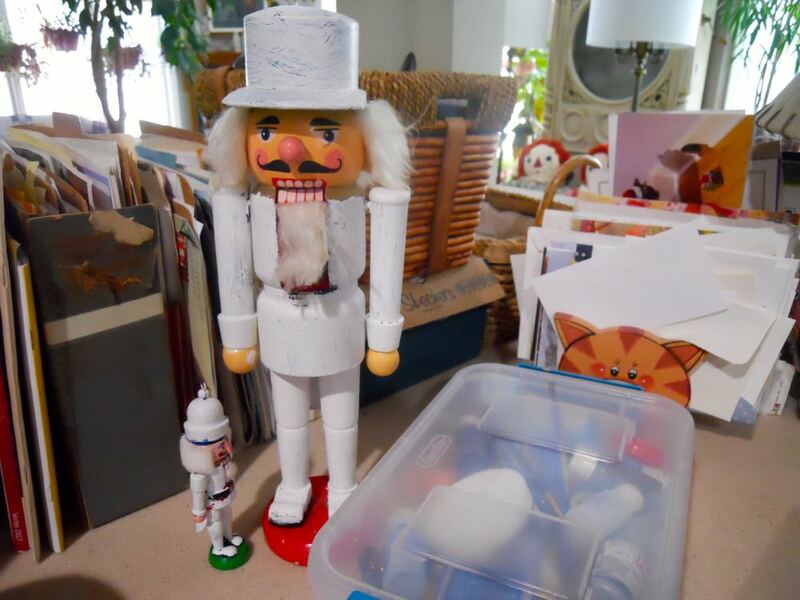 The soldier nutcracker is one of my favorite Christmas ornaments among the holiday traditions. I attend at least one “Nutcracker” ballet during the Christmas season and watch it on television whenever it is broadcast. Last year, I decided my bee buddy and gardening friend both deserved to get beekeeping nutcrackers but I couldn’t find any. I did find some soldier nutcrackers so I decided to make them into beekeepers. Taking the traditional soldier nutcrackers, I painted them all white so I could add beekeeper details. Since we all wear a white beekeeping jacket over jeans, it was easy to outline what parts of the wooden beekeepers needed further painting. Both nutcrackers needed a detail on top to flush out their hat into a beekeeper’s veil.I measured the top hat and cut out two pieces of white cardboard to simulate a beekeeper’s veil. Black tulle fabric simulated the black mesh that protects beekeepers in their protective suits. The tulle was hot glued between the two round top cardboard pieces. I then used black thread to gather the tulle at the bottom to cover the head. The bottom was even more fun to customize with blue paint for jeans. Tiny cotton sock pieces simulated pulling socks over jeans to prevent bees from climbing up pants legs. We had all met for a lunch during the lunar eclipse earlier that year so finding a wooden cat ornament that looked like one of his cats holding stars and half moons was very appropriate to add to the tableau. A tiny smoker off a keychain was perfect size so I added that to the base at the feet after painting it all green. Little glue on bees were scattered all over. I couldn’t resist adding some flowers so I found this old group of silk flowers that fit perfectly at a corner. I filled the back with dry hydrangeas spray painted green. 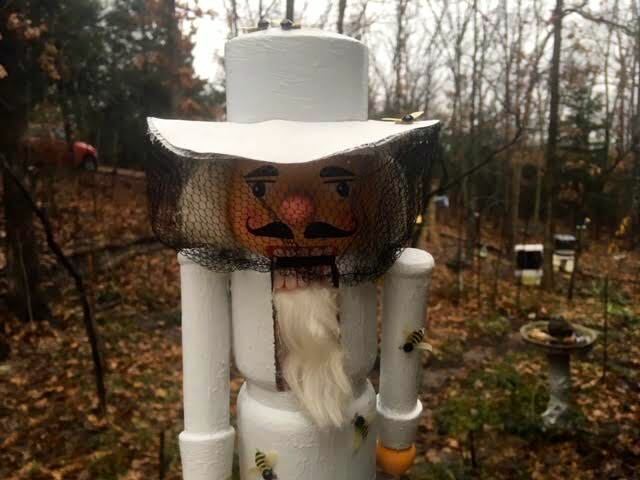 My bee buddy now uses a photo of the beekeeper nutcracker as his profile photo. I told him that was appropriate only now he’s going to have to grow a handlebar mustache if he wants to look just like the beekeeper nutcracker! When I learned to embroider at age 8, it did not cross my mind that I would be using that skill decades later to save a favorite fleece jacket from a close encounter with paint. Whether it is paint, a food stain or any other mark you didn’t mean to have on fabric, the simple daisy embroidery design can easily cover the mark so you can continue to use the item. Actually it doesn’t have to be just the daisy design. You can use butterflies, bees or other garden-inspired embroidery represented in this Buzzing Garden Baby Crib Quilt as your inspiration. The daisy design has become my go to design because it’s easy to do and can nicely cover a variety of stains. In this example, I ended up with yellow paint on a sleeve of this favorite beige fleece gardening jacket. Since I like to wear it also shopping and not only in my garden, I set it aside for a little rehab work. 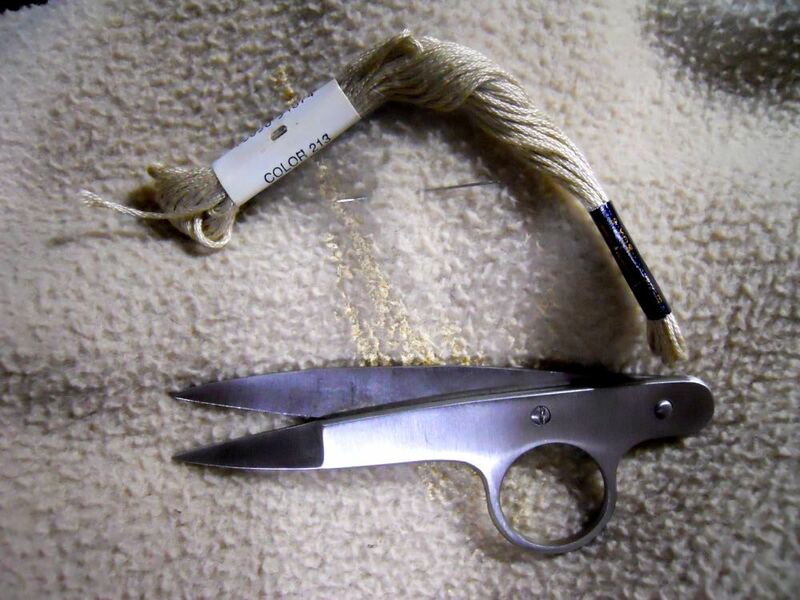 Start by choosing embroidery floss that most closely matches the color of the basic item. Matching colors will help the spot blend in. I could have also selected an embroidery floss that matches the yellow paint. That color selection would have made the spot more prominent. Once I had the matching embroidery floss, I just started the embroidery process, covering the yellow paint with the daisy flowers sewn very close together. As I covered the paint, a design shaped itself over the paint. To make the embroidery look more deliberate, I also embroidered several other patches on the jacket so that it appears to be part of the jacket look. In addition, I used thread snips to carefully and gently cut off some of the remaining paint since paint solvent would not remove it. I took the embellished jacket out for a spin earlier this week. It was nice to have it back and to be able to continue to use it! Periodically we get a thank you card or email about a custom baby quilt gift set that raves not about the baby quilt but the toy that is part of the gift set. I have to confess, we do put some thought into our toy pairings with the crib and baby quilts. They have to be appropriate for the age as well as safe. In addition, we want the toy to reflect and compliment the baby crib quilts. 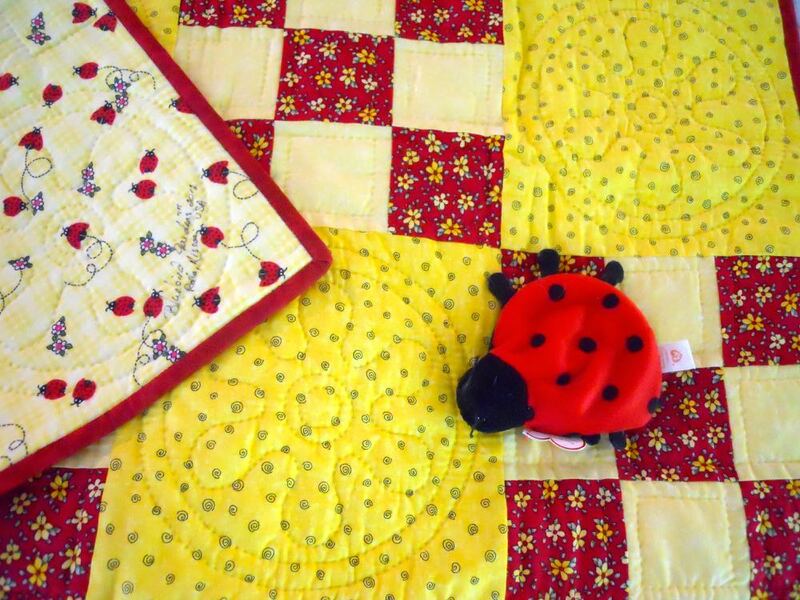 For our Ladybugs Ninepatch baby crib quilt, that was an easy match. Ladybugs have become a more popular retail item in the last few years so it was easy to locate something small that would be appropriate for the theme. This next baby crib quilt, however, was a different story. Camouflage is also a popular look but try to find something in hot pink! We waited to post this Pink Camo baby crib quilt until I could find exactly the right gift. Almost a year after we had the baby crib quilt in hand, I found this charming hot pink monkey. You can find stuffed toys at most big box stores. Also shop smaller boutique stores for the specialized toys. If you shop online, you can also find a wider variety of choices but for a baby gift, I would suggest seeing the toy personally to make sure it is appropriate for the age. Here’s one of reasons why we offer Howard RestoraFinish and Feed N Wax in furniture refinishing kits. These two products can easily give most woods a quick pick me up without you having to completely restore them. I consider these products must haves in my small arsenal of home improvement products and here’s why. 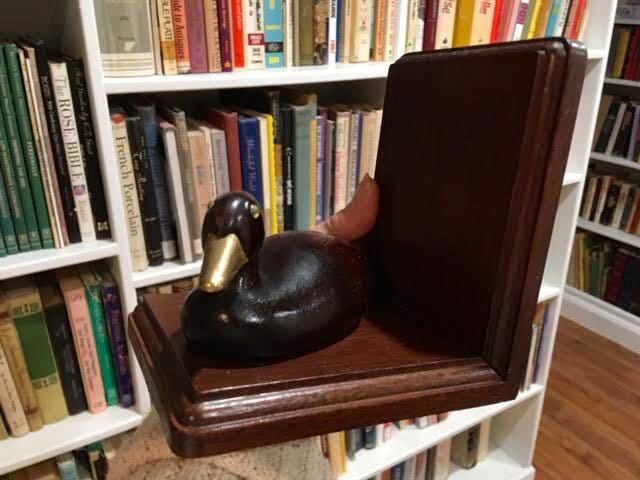 These four wood duck book ends were found at our local Goodwill store for $1 a pair. 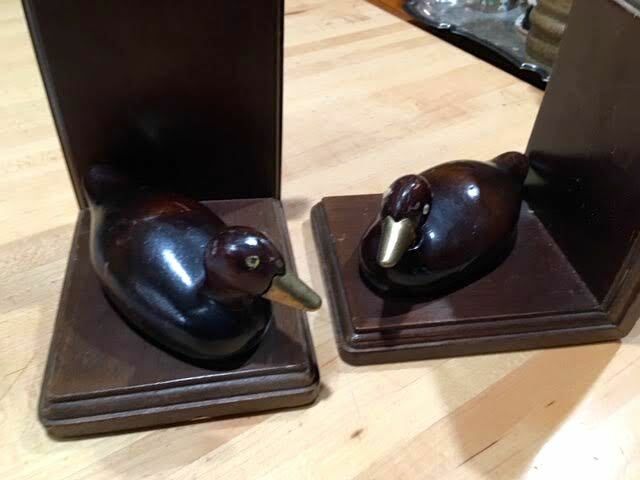 Both sets had the same duck missing the same eye but otherwise well-loved with wear spots and scratches. A little wood filler gave the ducks a new eye. Once dry, I painted the eye yellow, added a black center and finished with a coat of clear top nail polish. As I was adding back an eye, I dusted the book ends before using a paper towel to cover them with Howard RestoraFinish in walnut. I let them dry for a couple of hours while I finished another project. The wood was dehydrated so it dried quickly. Once dry, I treated the wood with a layer of Howard Feed N Wax and allowed the pieces to sit for about half an hour. Once buffed with an old cotton sock. the ducks were ready for a swim in my library. Every time I use these products I am delightfully surprised at the results! If you do any kind of sewing, you know how hard it is to organize, and keep organized, your spools of thread. We grew up making a lot of things, especially for gifts, and one year my 9-year old brother made this thread spool organizer as a gift for my Mom. I still have an old hat box with some of her thread spools, forming a nice tangled mess every time I try to paw through it looking for a particular color. My brother made the handmade thread spool organizer all by himself so you know it is relatively easy to make. And since i have it after all of these years, you also know it is practical as well as appreciated! 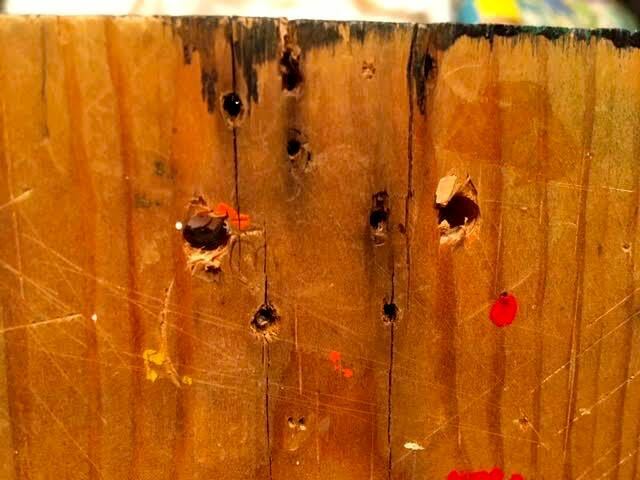 You will need a piece of wood, 1.5 inch nails, a hammer, a ruler and a pencil. This particular handmade thread spool organizer is 11x17 inches with 5 rows across and 7 rows down. Mark the straight lines down, then across. Where the lines intersect is where you will hammer in the nails. My brother doesn’t remember if he painted this or just recycled a piece of wood. My guess is it was recycled. The back has a picture hangar so that the handmade thread spool organizer can be hung in a sewing corner. Looks like there were several hanging options. I need to add a picture hangar to the back side, now I remember why this is leaning against the wall and still doing its work. My mother repurpsed an old spice rack, left, for her sewing items: sewing machine needles, pins, pieces of ribbon. These two work well as my little sewing support station. You can find the spice racks at local thrift stores and vintage shops. If you make one, would you please share a photo? Periodically a potential customer asks for help to personalize an item without us having the item in hand. Our suggestion is to custom embroider the name and special date on a matching and complimentary fabric so that a label shape can be ironed before it is hand sewn onto the fabric item. If they don’t have time to get it machine embroidered, they can hand embroider on the fabric. If they can’t hand embroider, indelible pens come in handy to write out names and special dates. We have made the custom personalized embroidered labels to be added to clothing, quilts, handbags, fabric totes - even hats although sewing through the hat canvas was challenging without heavy duty sewing needles. Sometimes the customer doesn’t want the custom personalized embroidery on the front of a handmade quilt, like this burgundy double wedding ring quilt so we added it to the back of a quilt corner so the name and date is on the quilt commemorating that very special day. How have you added custom personalized embroidery to your handmade gifts? Sometimes the prices of dried wreaths stun me but then I have been making my own for years. Whether you are making them for yourself or as a housewarming and wedding gift, or just for yourself as home decor, dried wreaths are easy to make and can be easily be updated every year. The most challenging part is finding the dried grasses, leaves, flowers and seeds that make each wreath interesting. Great excuse to take walks in your neighborhood, and through your garden, and look at your plants with a new eye. 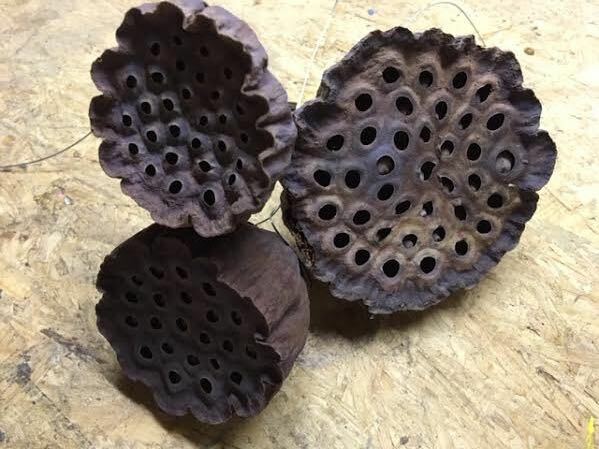 Another popular seed pod for dried wreaths are water lotus pods. Water lotus are native to Missouri. Water lotus pods add an interesting dimension, too. They are expensive to buy at craft stores but grow free in your pond if you have the flowers. You can make your own base wreath or buy one, whichever is easier. Honeysuckle makes a good basic wreath as does kudzu and English ivy. And who doesn’t need another reason to pull those two invasive plants out of the garden?! If you check thrift stores and yard sales, you can also find a wide range of basic wreaths that you can use, from plain wire frames to wild grapevine wreaths, which I use because I have wild grape vines growing in my limestone hillside garden. I wait until fall and the leaves are off to collect the vines and wind them into the wreath shapes. Sometimes I leave the dried leaves on for interest but then don’t last long. Make sure you have a solid way to hang the wreath either by adding a wire at the top or using something similar to hold the vine bundle together so you can easily hang it. You want to have some basic materials to start adding to your wreath. In one of my grape vine wreaths, a family member sent me a ladybug welcome sign that I added in the center. You can find signs at most craft stores. Farmer’s markets also have artists with signs who can also make custom signs for you. Visit Etsy.com and Pinterest.com for inspiration if you want to make your own. You can find a variety of items in your own backyard, starting with dry leaves and seeds, such as acorns. Local wildflowers are a wonderful source of inspiration and wreath material. Wild yellow indigo flowers along one of my walking paths leave a lovely grey foliage that became the basis for this first dried wreath. The red sumac flowers and yellowish panicle hydrangeas add some color and interest with different shapes. The pop of green is from holly bush pruning. The misty purple moving up the wreath center is from Russian sage trimmings. I don’t add all of these items at once, I embellish through the season when I find something that will add a pop of color and interest. You can also add other items to these wreaths. The wild grape vine wreath at the front of my house has a little bluebird birdhouse I picked up for $1 because it was missing a beak and part of a painted eye. With a little patience, I repainted the eye and added a new orange beak. If I can find my fishing line that would work better to hang the birdhouse from the top of the wreath than the grey string I am currently using. Periodically I do find birds checking out the birdhouse and that’s fine by me. If it gets used, I will clean it out at the end of the season and hang it back up. Other wreath additives could be pine cones and dried fruits. One year I added dried orange peels. Another year I had some interesting grasses that were soon consumed by local deer. The bluebird dried wreath also has some trimmed Russian sage for a pop of green. This is the first year I added the Russian sage, will be interesting to see how long that stays green and how long it lasts. I suspect my local deer herd will yank it out as they taste test the greens. If you don’t have wildlife nibbling on your wreaths, you can spray them with a clear spray to preserve them once a year. I don’t because of the wildlife visitors but I find the wreaths last a good long while without the extra preservation. They are located under eaves and out of the elements. No time to gather dried flowers? Here’s very simple inspiration to make a quick dried door wreath. Find a basic wreath shape and color you like, then add a couple of dried items. For this door wreath I found the basic berry wreath at a local thrift store for $1. I dded the grey wild indigo leaves and a few clusters of dried oak leaves from my garden. The contrasting colors were enough to make the original red and orange berry base wreath look finished. Weeks later, I found the little woven bee skep at a thrift store for a quarter and made the center sign out of a painted paint stirrer that comes with paint cans. The sign took the most time; everything else was a matter of minutes. Dried wreaths warm up doors and entryways, last nicely through cold winters and can easily be updated every year. They also make nice housewarming and wedding gifts. Half the fun is looking for new things to add to them! Have only one or two flowers still blooming in your garden? 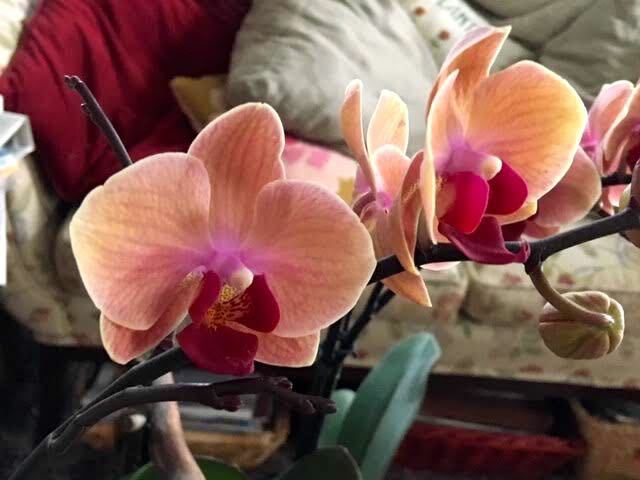 Take your cue from the Japanese and celebrate the beauty of those flowers by bringing them inside, especially if it is just one flower. One flower can look very striking in a flower vase where everyone can enjoy it. If they are small flowers, put them in a tiny vase that compliments their size. I did not plan to bring these two pink Knock Out roses inside. They were inadvertently brushed off their mother plant, still in bud form, and I didn’t have the heart to toss them. At this time of the year I have only a few plants still flowering, giving these roses a special place amongst my wildflowers. Brushing off a tiny, 1.5 inch water-full vase, I now have them on my den table keeping my ceramic pencil holder and ladybug candle holder company. They have opened slowly, giving me time to appreciate the simplicity and beauty of this modern rose. When everything is in bloom, it’s easy to overlook the details of one flower. The end of the growing season is a good time to appreciate what we have and to look forward to the beauty of next year. 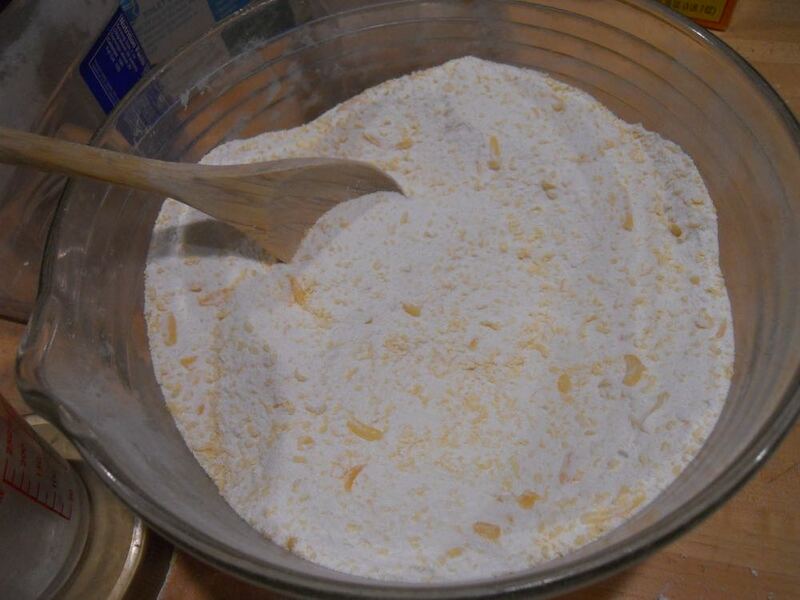 Basic ingredients, and utensils, to make homemade laundry detergent. Maybe you don’t like all of those scents added to commercial laundry detergents or someone in your family has an allergic reaction. Or maybe you have a well-loved quilt you want to wash and don’t want to use more harsh chemicals on the older fabric. Whatever the reason, it’s very easy to make your own homemade laundry detergent without all of those additives. You will save money along the way, too! I have used this recipe both with and without OxiClean. Since I was trying to determine what was causing an allergic reaction, I removed the OxiClean. It worked quite well without it. The most time-consuming part is grating the bar of soap. I ended up using a cheese grater, then crumbling the smaller soap pieces with a roller. 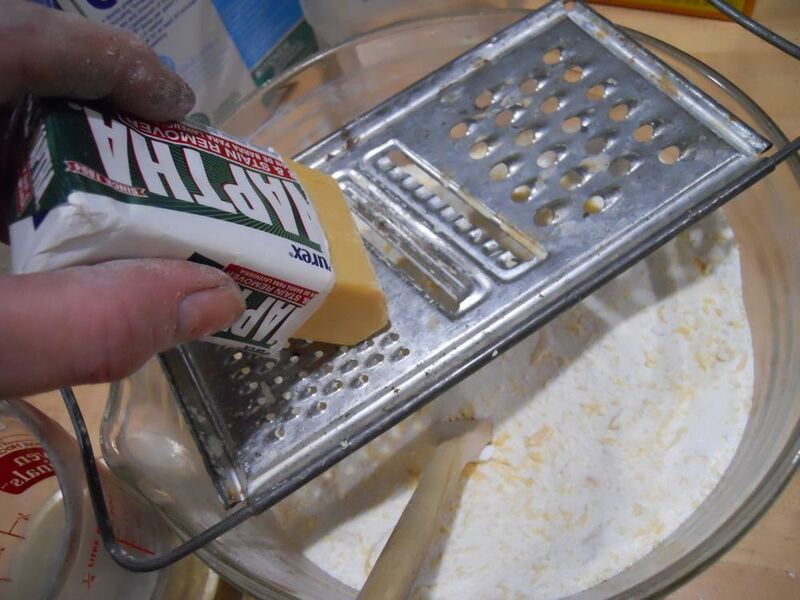 Use a cheese grater to make soap pieces to add to the laundry soap mix. You can use any soap of preference. Since I was trying to eliminate possible sources of skin rashes, I use the mildest available soaps: Fels-Naptha and plain Ivory. No time to roll the soap? Not a problem, this is how it looks when you are mixing it all together. This has both the larger soap pieces as well as the smaller crumbled ones. I include both because I was playing with the different sides of the grater. This is how the finished mix should look with little yellow dots of soap mixed in. Once done, store in a container. I repurpose old peanut containers because they have handles on the back side, making them easy to lift. To use, it takes 1-2 scoops per full load. I use 1 scoop on my household and day clothes, 2 scoops on the gardening items where the washer water turns brown. Store finished mix and make sure to mark it. I recycle these peanut containers for my detergent. Earlier this year, I made a batch for a friend looking for a laundry detergent without all of the added perfumes. I picked up containers similar to these at a local big box store and added a label with her name on it. She asked for the recipe so the next time I make it for someone, I will include the recipe. She was so thrilled to get this I can say this would also make a nice housewarming gift! Even with stabilizing backing, stretch fabrics can develop wear spots and tears. Every once in awhile, we get to see one of our custom quilts returned for repairs because they've been well-loved and used. That was the story behind this round custom quilt made out of t-shirts and other favorite clothing. One of the shirts, a polkadot pink with white dots, tore along the longer side. Another couple of wear spots were developing on the short side of the block. The customer asked if there was some way we could replace the torn block with a new piece of clothing. Taking a close look at the finished quilt, it was not possible to tear out the pink polkadot fabric so we did the next best thing. Selecting a piece of sturdy, all cotton gross grain cotton ribbon, I sewed the ribbon on two sides over the long tear to keep it from moving. Securing both sides will reduce either block from tearing and will hold the torn side together. The same ribbon was sewn across the shorter side to cover the newly-developing wear spots. Grossgrain ribbon is an excellent way to reinforce worn spots and repair tears. 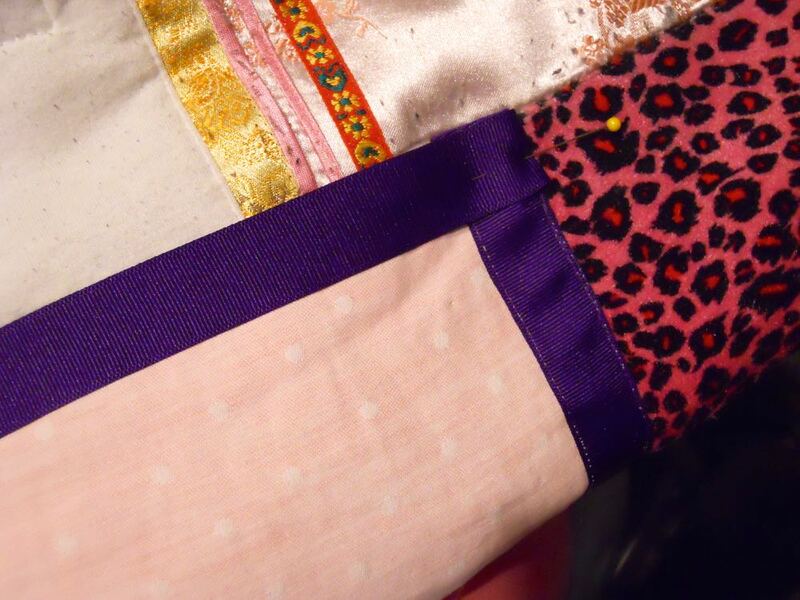 Since several other quilt blocks had ribbons either in or along the side of the blocks, the purple gross grain ribbon fit right into the rest of the blocks. If you don't want to use ribbon, you can make your own ribbon out of fabric reinforced with a stabilizer to ensure the fabric ribbon can handle the pressure. The complimentary purple gross grain ribbon color blends right in with the rest of the blocks. It was fun to see a custom quilt back and so well-loved. As I tell customers, quilts should be used, not stored away somewhere. And if there is a tear, there's usually a way to fix it! You are going to start seeing these gourds at local farmers markets late summer so I wanted to inspire you to think ahead. 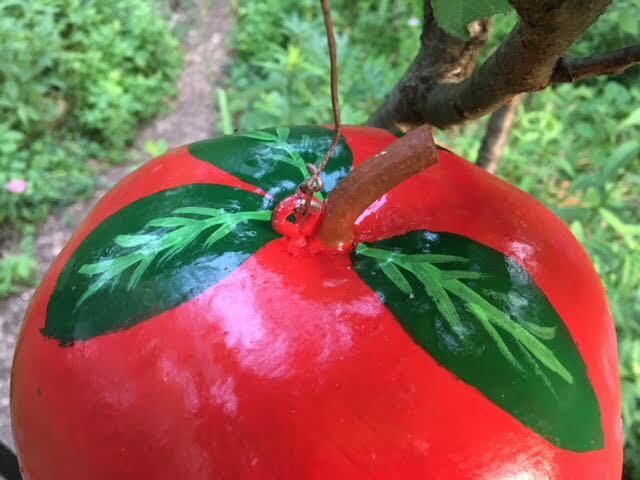 These gourds can make charming homemade gifts as hand painted birdhouses so this is how to make them into something simple: apples. The gourd will also need holes on the bottom to let any moisture drain. A simple drill bit 1/4 inch wide will do the trick. Simple eye hooks securely screwed into the top will work to hang these gourds. I used copper wire from plant packaging to give the gourds a safe hanging wire. Now paint the gourd with a good primer. Once dry, add a coat of red. I used Valspar satin paint sample jar, cost around $2.50. Once dry, I added two more coats, drying in between. The green leaves where added free hand first in a solid satin dark green, those took two coats. A lighter green gave the leaves some dimension. The stems were painted brown; those took only one coat. Once dry for a good 2 days, I finished by spraying with a clear plastic coat. So two gourds will welcome wrens. The third one, with the wider opening courtesy of a wintering mouse, might be attractive to nutchatches or maybe a yellow bellied sapsucker. Better yet, make a painted apple gourd to add to one of our songbird throws and you will have songbirds in hand. Now wouldn't you like to get one of these as a gift for your garden? If they came in a vase, put them where you can enjoy them but keep them away from heat vents and sun. Don't place them on top of TVs or near electronic devices that get warm, the heat will shorten the lifespan of your beautiful flowers. If they were in a box, get a vase and make sure to wash it with hot water and dishwashing detergent, rinse and dry, then fill vase 3/4 full with room temperature water. Add a penny to water to help keep bacteria from growing. I have also used half an aspirin. Most florists also provide floral flood packets. Don't save the packets, use them! Measure the first stem against the vase you want to put them in and make them taller since you may be cutting them down several times. Cut the bottom of the stems under room temperature water with sharp pruners or a knife, making a 45-degree angle cut so the stem can take up water. The running water helps the stem take up the water; that helps keep the rose stay saturated. Also remove all leaves that will be submerged in water. Add the florist food packet, mix, then add the remaining trimmed roses. Whether already in a vase or you add the flower to a vase, plan on cleaning the vase, replacing the water with fresh, room-temperate water and making fresh stem cuts every 2 days. If you received carnations, mums and Peruvian lilies, these flowers are longer lasting but also would appreciate fresh water every 2-3 days. Also trim the stems so water can get absorbed and keep the flowers in bloom. A bouquet of Peruvian lilies I bought around Christmas lasted 9 weeks with a little extra time cutting off the stems and placing them in clean water every few days. If your gift was a plant, remove the decorative paper immediately and place a tray under the pot to catch water. Check the soil to determine whether it is wet or not. If it is dry, give it room temperature water until the soil is saturated again but not wet. Read the enclosed care instructions, they will tell you what kind of light conditions your plant needs. Then place the plant in appropriate lighting conditions. Most orchids, for example, like indirect light similar to African violets and English primroses. Spring bulb gardens prefer full sunlight so the sprouting leaves can collect energy in the bulbs. Once bulb gardens finish blooming, keep watering and allow the leaves to turn yellow. The bulbs can then be planted in your garden for re-blooming after the bulbs have recharged their bulbs. On a personal note, keep the flowers where you spend the most of your time so you can enjoy them. Even though they may appear beautiful one day, room conditions may change and speed up their fading process so don't take them for granted. And there is nothing wrong with buying yourself a flower bouquet to brighten a room so go ahead, splurge and enjoy! 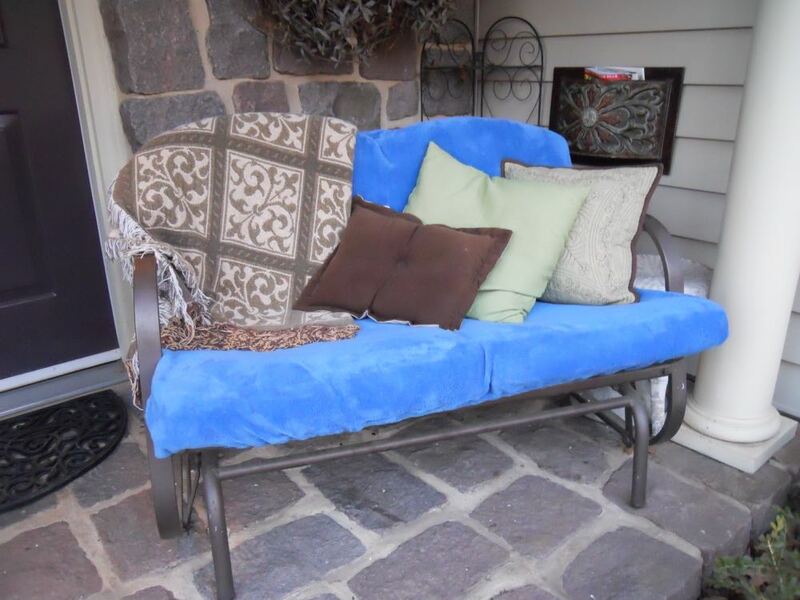 My front porch love seat with it's brand new blue, ever so soft love seat cover for $3.50. I am so tickled with the results I had to share. Do you have an outside love seat that's seen better days? Mine wasn't bad yet but it was - well, orange. More of a terra cotta, ceramic plant kind of orange but orange, and a plastic nevertheless. This plastic orange love seat works well in hot summers but not so much in cold winters. 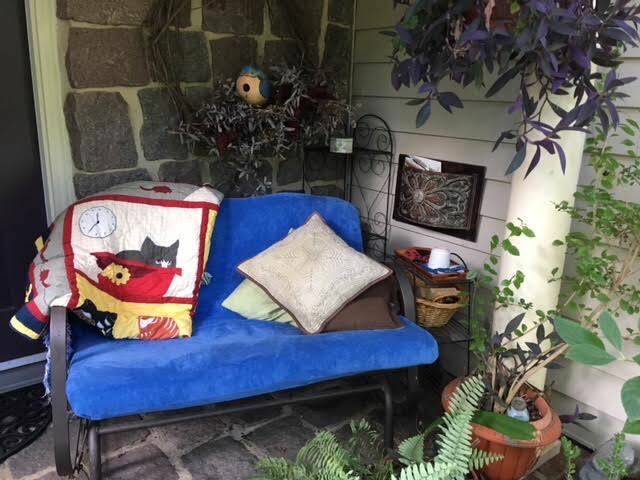 The front porch love seat was fine for hot summer days but it looked out of place after last year when I repainted all of my garden benches a wonderfully uplifting blue. They now stand out nicely among the greenery, or winter drab, and give Bluebird Gardens a bit of a nod. My formerly-red garden bench had a new back added and a couple coats of blue paint. Although I knew I would eventually have to tackle the front porch, for winter I just draped a soft tan throw over it so I could sit out on the bench and watch it snow, or rain, or just sit. Although it was warm, the throw moved around a lot and still didn't look quite right. A temporary tan throw over the orange love seat was hard to sit on without losing the throw. How hard could it be to find a blue love seat slip cover, I thought to myself. Well, it was not an easy search. There are a number of beige, brown and black ones but few in the matching blue. I finally located one for $229 not counting $14.95 shipping. Not wanting to spend that much money on a seat cover that may be visited by squirrels, birds and my grungy pants, I started looking through local thrift stores hoping I might find something there that was better than orange. Yes, my expectations were pretty low but anything would have been better than the plastic orange. These two pre-owned 50x60 inch throws were the perfect blue color for $4 for both. At the local Goodwill store, I found two 50x60 fleece throws originally from Walmart in the perfect blue color. I thought I would have to sew the two together to have enough fabric but I wasn't sure so I picked both of them up. A few pins in the right place and I cut off all four throw edges to give it a fit at the corners. Cutting off the 50x60 inch throw corners and sewing them gave the love seat a finished look. Leaving the back of the seat cover open at the corners allows me to easily adjust the elastic. Not only does it nicely fit in with my other garden benches, but I made two, one for when the other one is in the wash.
Total price? $7. The fleece blankets were $2 each, then I used about $3 in elastic. If I deduct that from the $245 I was initially going to spend, that leaves a nice little account to buy plants. It's a family joke, I grew up learning several different ways to do math and one of my brothers calls that my "gardening math." I'm going outside to sit on my new front porch blue bench and dream about what new plants I will now buy. On sale, of course! This purple English primrose is ultra violet, the official color for 2018. Every year, Pantone, Pantone Inc. a U.S. corporation headquartered in Carlstadt, New Jersey, designates a color of the year. Their Pantone Matching System is used by a variety of agencies, primarily printing, to designate exact colors. For 2018, Pantone designed "ultra violet" as the color of the year. "A dramatically provocative and thoughtful purple shade, PANTONE 18-3838 Ultra Violet communicates originality, ingenuity, and visionary thinking that points us toward the future. Very creative writing to describe a color. I like any flowers colored purple, don't you? My kitchen counter looks like a mini yard sale for Christmas decorative items, only none of them are for sale. These Christmas favorites are getting repairs before I put them away for next year. A variety of felt pieces, usually Christmas colors get used the most. One of my favorite items, paintable wood filler, is very versatile. I can actually replace missing tiny wooden pieces by making new ones with the wood filler, then painting the new piece to match or blend in with the rest. Also on the list, clear glue or white glue that dries clear. Super Glue is too messy, I end up with more of the glue on my fingers than on the item I am repairing. Christmas colors felt is also handy to have in white, Christmas red and green, and black. Little ornaments with broken heads get glued back on and wrapped in a tiny scarf to cover their broken parts. For the wooden items, Howard Feed 'n Wax gives them a nice hydrating treatment. 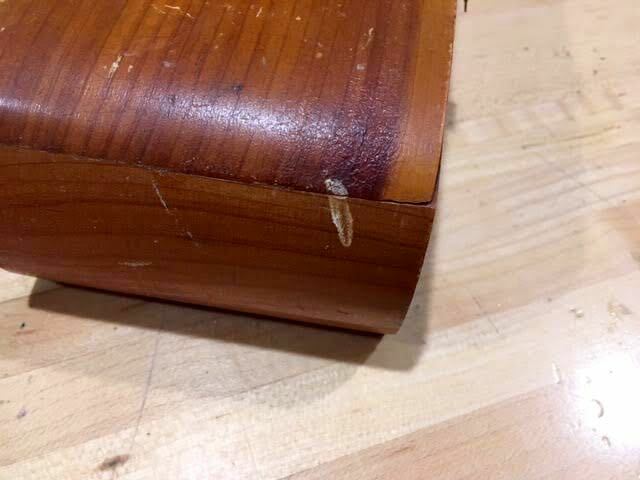 Actually, I keep Howard Feed 'n Wax handy whenever I move things around, the beeswax and carnauba oil helps to keep my wood beautiful with very little special care. This wooden angel lost one wing and part of her wooden halo when she was knocked to ground. Halo and wing made from wood filler has been painted with gold paint, ready to get back to angel choir. I also keep a little container of paints I can turn to for minor repairs. If I need to mix them, I use a little bottle cap to mix the amounts, rarely do I need to mix a lot. If I need more paint, then it's time to splurge on paint sample bottles! This little wooden horse now has a new right ear and paint job. Some years I have waited to make the repairs at the beginning of the holiday season but now I like doing it right after. This way I remember what repairs need to be made and they are ready to be placed into service next year as soon as the season starts. So which one are you, do you make Christmas decor repairs before Christmas or after Christmas? I put my tiny Santa hat on again tonight so you can see the hat being worn. The forecast was for a winter storm and snow tonight, a couple of days before Christmas, so I decided to make my rounds today with honey gift jars. To get into the holiday mood, I wore a red scarf and my Santa hat, my teeny tiny Santa hat. Among the benefits of this tiny hat, no bad hair from wearing the hat and it's hard to not get a smile, or two. Actually I tend to forget I have it on and today was no exception. Almost at every stop, someone asked where I got the tiny Santa hat so here is how to make your very own. You can make your own out of red and white felt and add a little white ball at the hat tip, or you can buy the hats ready made. This little supply was originally sold at Hobby Lobby and I found it at our local Salvation Army store for $1. The hair clips came out of my hair accessory box but I think they originally were purchased at a local beauty salon store. The hair clips are pretty common so you should be able to find them at most big box store hair care sections. Tiny Santa hats, hair clips and a hot glue gun or needle and thread is all you need. To attach the hair clips to the hats, you can use a glue gun or sew the clips to the Santa hats. To position the hair clip, place it inside the Santa hat so only the teeth of the clip is visible. Then either glue or sew the clip into the Santa hat. Place the hair clip inside the hat and either hot glue sides to the clip or sew the clip to the hat. Last year, my friend Margaret, who introduced me to the tiny Santa hats, and I made a few extras and enjoyed passing them out around St. Louis. The young ladies at store check outs were the most thrilled to be presented with one so make extras to share. I had a few extras last year so I shared with local friends, including my friend Ina. Next thing I knew, she was loaning her Santa hat to one of her friends. My friend Ina let her cat Oscar try on her tiny Santa hat, he's handling it well, don't you think? I don't recommend putting these on pets but love this picture of Oscar wearing his Santa hat. So make a few more than you need and pass them out when someone asks where you got it. Half the fun is watching their faces light up when you hand them their very own.